The Siena Model 600 for straight stairs is compact, easy to use and well equipped with comfort and safety features as standard. It is robustly built to carry up to 350 lbs. The Siena model stairlift was designed for narrow stairs. 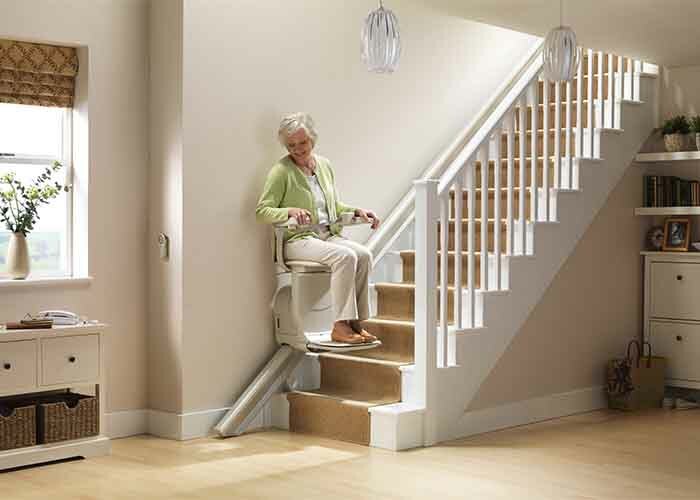 A door at the top of the stairway creates no problem for our stairlift. The rail sits close to the wall, leaving plenty of room for others to travel safely and comfortably up and down the stairway. The arms, seat and footrest folds up so as not to block the stairway. And no bending over to fold up the footrest! Our footrest folds up at the touch of a button located on the armrest. The stairlift’s continually recharging batteries ensure that your stairlift is always ready for use. An optional retractable rail is available if the stairlift rail protrudes at the bottom of the stairs blocking a hallway or entrance. At the top landing of the stairway, the chair swivels to face the top landing, blocking the stairs behind you and providing added safety. Hershey, Harrisburg, Middletown, Mechanicsburg, Carlisle, York, Gettysburg, Lancaster and more. Call for all available cities.